Throughout the last few years, hiking opportunities in the Hickory Nut Gorge area southeast of Asheville, NC have slowly been expanding. While locals have been hiking in the area for decades, there haven’t been a lot of publicly sanctioned trails, except for the few inside the privately owned Chimney Rock Park. But those come with an admission price. 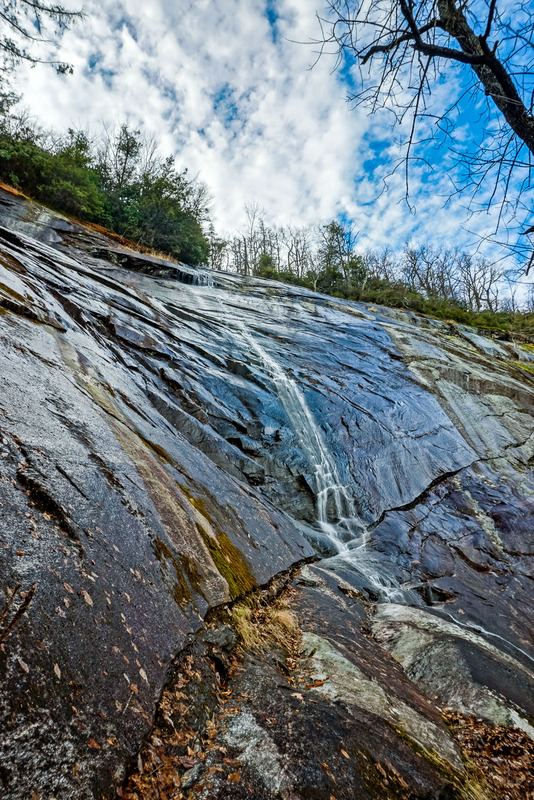 Spurred by the purchase of Chimney Rock Park by the state of North Carolina for the subsequent creation of Chimney Rock State Park as the Gorge’s centerpiece, and aided by other purchases and easements through local land conservation organizations, the amount of space officially open to public recreation in and around the Gorge has increased dramatically over the last decade. 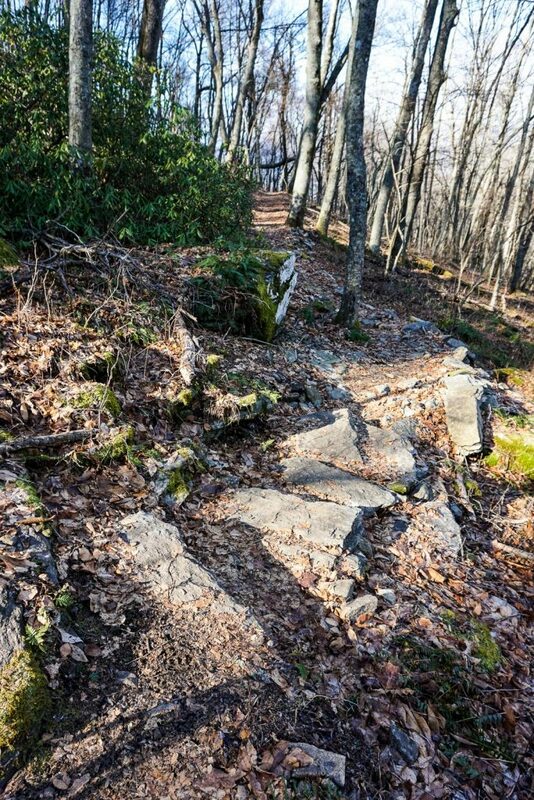 And along with new protected lands have come some new trails, which have started to allow people to experience the beauty found in this section of North Carolina’s Blue Ridge Mountains. Long-range plans for the area include a long-distance trail that encircles the entire perimeter of the gorge. But that trail is being built in smaller pieces, which have their own names. Three of those pieces are now complete and open to the public: the Bearwallow Mountain, Little Bearwallow and Trombatore trails. We explored the latter two in December 2014, and below are our trip reports from those hikes. Before the trip reports, let’s talk a bit about the first trail to be constructed in the area. Bearwallow Mountain sits near the upper end of the gorge, on its southwest side, and is one of the highest peaks in the area at 4232 ft. in elevation. 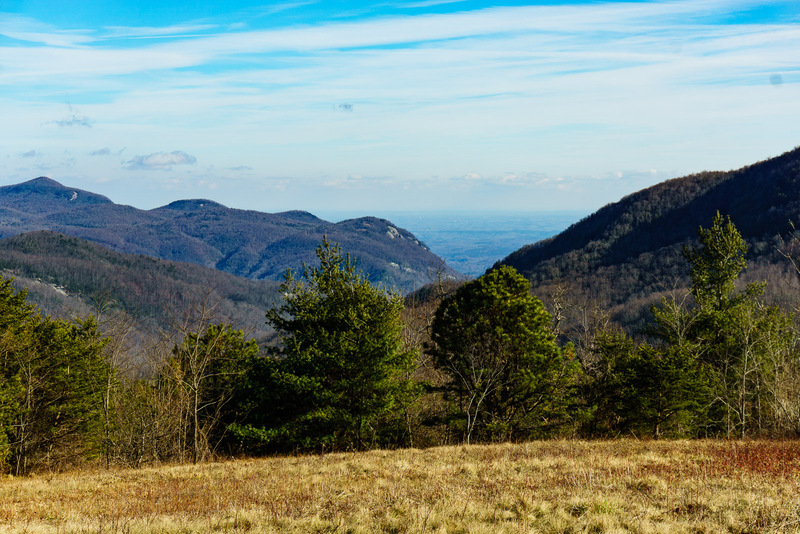 The Eastern Continental Divide splits the summit, then loops around the upper gorge before connecting to Little Pisgah Mountain on the other (northwest) side. At 4412 ft., Little Pisgah is the higher of the gorge’s two ramparts, but Bearwallow is better known than its higher neighbor because of its accessibility. Bearwallow Mountain, as seen from the destination on the Trombatore Trail described below. 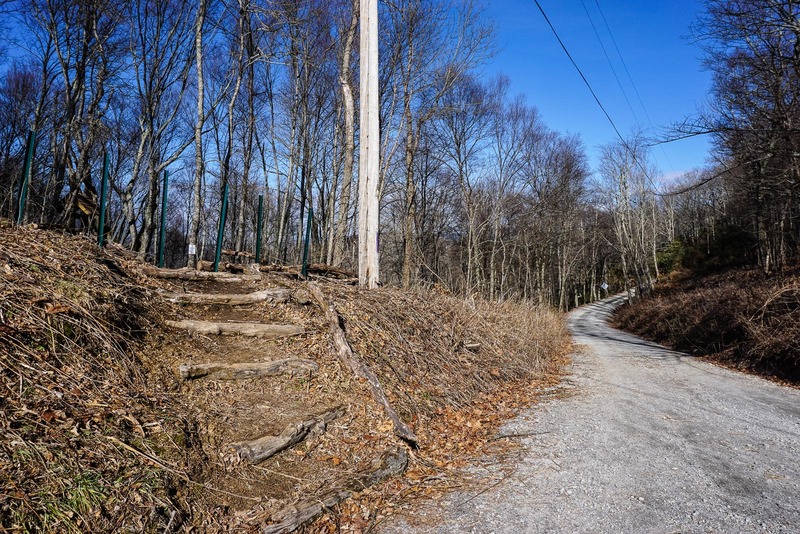 For years, locals have parked at bottom of the service road that leads to its summit and hiked to the top, where a forest of trees disappears and is replaced by a forest of communications towers. I’ve been visiting it myself with my family as a kid since the early 90’s. 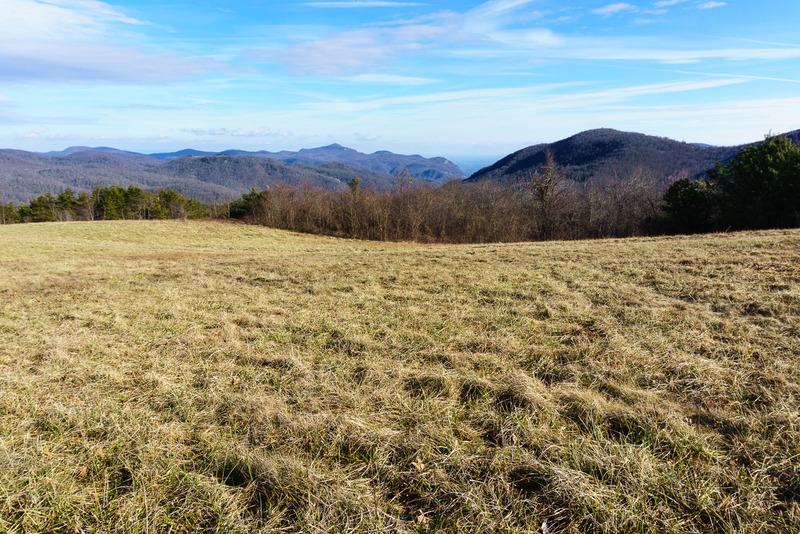 Now, with the summit under a conservation easement and an official trail leading to the top, everyone can comfortably enjoy Bearwallow’s open meadows and the splendid views they provide. 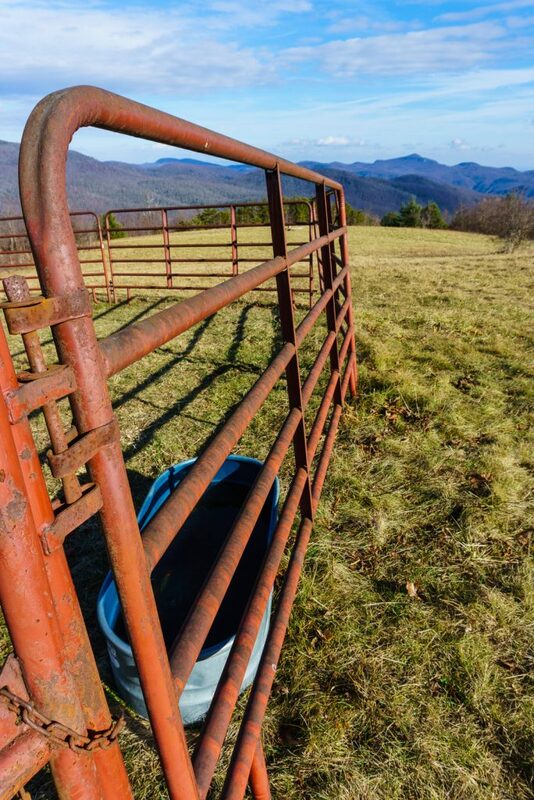 The meadow at the top of Bearwallow Mountain, with its cows grazing and communications towers bristling, exemplifies the typical environment in the Hickory Nut Gorge. Rather than having a wilderness or backcountry feel to it, the areas these trails bring you to feel more rural. Pockets of exceptional natural beauty remain, tied together by more developed or disturbed areas in between. 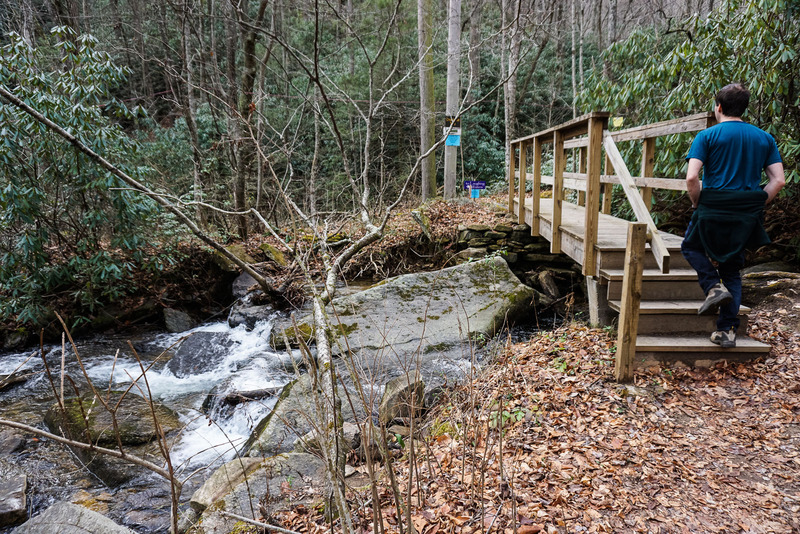 Bearwallow Mountain was the first of the three trail segments to open and we have given it its own trailhead page on HikeWNC.info. 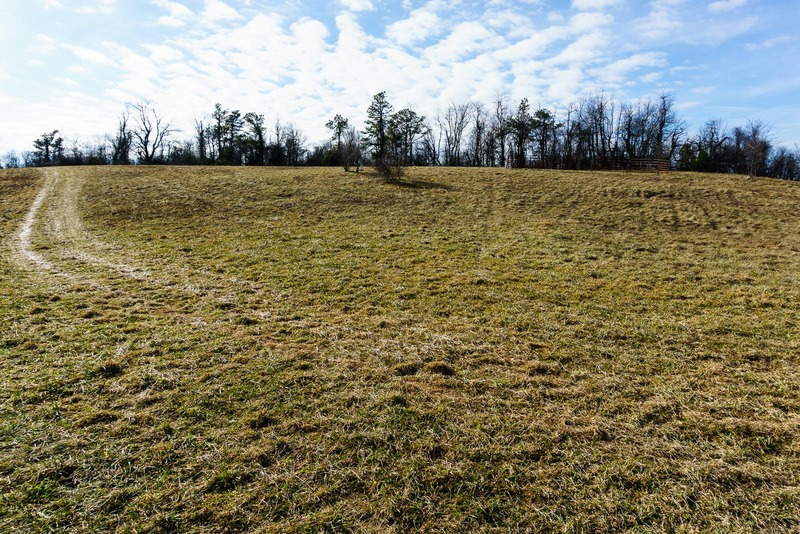 A chunk of conserved land, called the Florence Preserve (which also has its own trailhead page on HikeWNC) sits on the edge of the gorge northeast of Hickory Creek, on a lower ridge of Little Pisgah Mountain. It has its own little trail network inside it, and it is accessed from the new Upper Hickory Nut Gorge parking area along US 74-A. From the same parking area, you can now access a trail leading in the opposite direction, to a waterfall on the side of Little Bearwallow Mountain. The trail passes over private and conserved lands, and ascends quickly up the slopes of the gorge to the bottom of a cliff band. 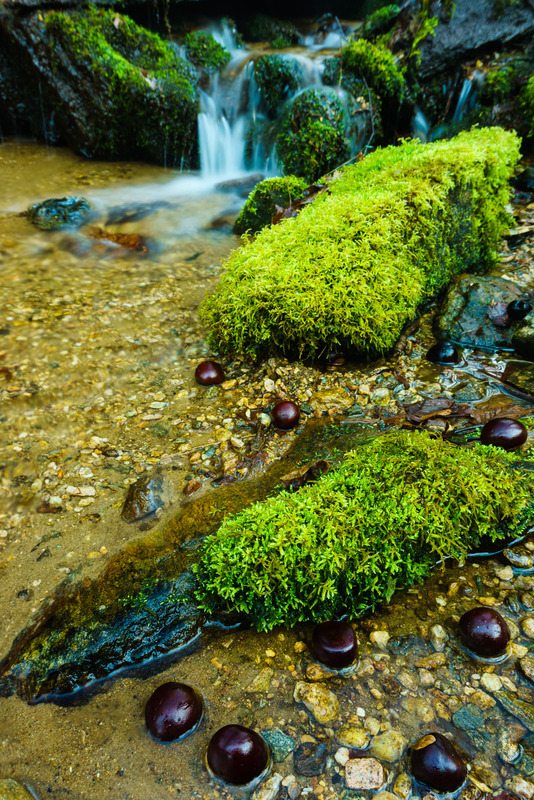 A tiny stream flows over the cliff to form Little Bearwallow Falls. On a beautiful warm day in late December, 2014, a group of us hiked the new trail to check it out! Crossing Hickory Creek at the start of the Little Bearwallow trail. It was a varied group of hikers, so I’d say the trail up to the falls is accessible to most folks with some hiking experience. It’s about 1.1 miles from the parking area to the falls, with a 650 ft. elevation gain. The newly-rebuilt trail is in great condition and is well constructed, with few obstacles along its first part. The forest is nice, and contains an understory of the less-common rhododendron minus (as opposed to the more typical Catawba and Rosebay rhododendron, some of which grow here also). After crossing the small stream well below the falls, the trail gets a bit steeper and passes though some rock steps. Still, I wouldn’t call it “rocky” because the steps are quite artfully arranged. I’d rate it moderate overall – everyone in our group was able to keep up. When you arrive at the falls, you may wonder if you’re actually there. It’s very high (I’d estimate well over 100 ft.), but there is only a tiny drainage area above the cliff, meaning it’ll have to be a rather wet period for there to be any water going over it. It’s scenic when the water is flowing, but that might not be the case for most of the year. Still, the cliff is impressive and worth a look even if it were dry. From the falls, the trail is still under construction as of January 2015, but it will eventually continue along the bottom of the cliff band, past an overlook called Wildcat Rock (expected late 2015), up to the summit of Little Bearwallow Mountain, and then up Bearwallow Mountain proper. We hiked that bit as well, but I wouldn’t recommend it just yet. The Trombatore Trail was the most recent segment of trail to be constructed. 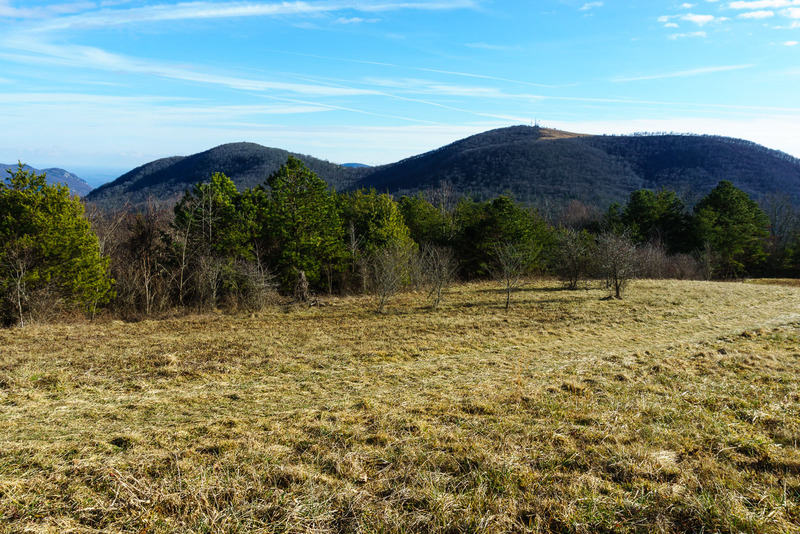 At Bearwallow Gap – which is also the starting point for the Bearwallow Mountain trail – there is enough room to park along the road, and that’s where I started a solo hike out to Blue Ridge Pastures. 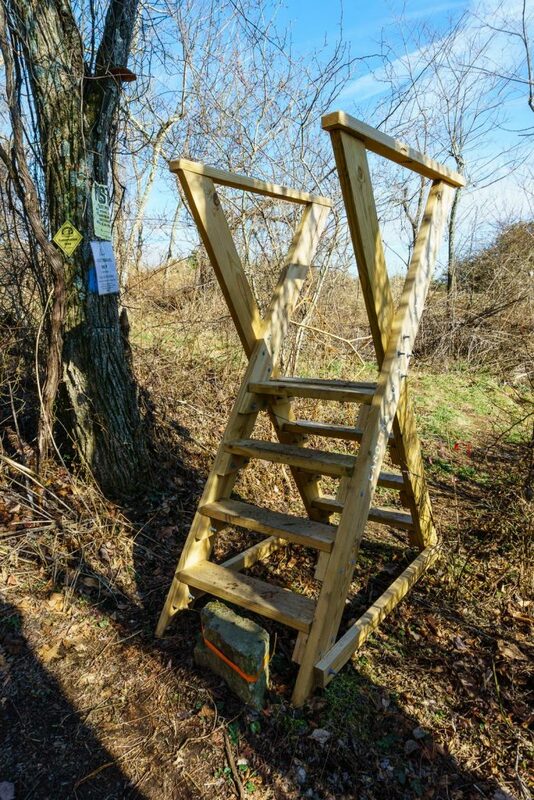 The trail begins on a new set of steps on the northwest side of the gap opposite the Bearwallow Mountain trail, and a sign board is there to give you more information about the trail. The first section of the trail is hand-built tread, and it quickly showcases some of the beautiful work that has been done to make the path complete. The trail approaches some of the impressive cliffs that line this part of Bearwallow Mountain, then swings away through a few switchbacks. Icicles lined the rocks on my hike, and frost heaved the trail surface, which will be common in winter months. Sunlit areas were slick as the melted water collected on top of the frozen ground underneath. Nice rock work along the first part of the Trombatore Trail. The trail winds downhill on the northeast slope of the uppermost part of the Brush Creek drainage. The forest is a bit older here than it is further on. You start out right in the transition area between a Northern Hardwood and Cove Hardwood forest, and gradually descend into the Cove Hardwoods. Only a couple of trees of significant size are present, but at least one is quite large and burly. Another curls up from the ground like a pig’s tail. No water was present in the rocky washes and gullies the trail crosses at first, but as the trail begins a longer northwesterly jaunt, I passed the source of Brush Creek, which I could start to hear off to the right. I’m not sure if it was a spring, but it looked like it from my vantage point on the trail. Past that, the trail took me down into a maze of old logging roads where the forest becomes filled with younger trees. The trail swings right onto one of the old roads, then climbs uphill through the same drainage, before swinging left across the only real creek crossing on the hike. The water is piped under the road and it’s only a small trickle, so you’ll stay dry. There is obviously a buckeye tree growing here – buckeyes were lying in the stream next to these mossy rocks and I couldn’t resist getting a shot of them. Next, the trail started climbing back toward the ridge, which it approaches closely a couple of times. Old logging roads swung off in all directions, but signs kept me on the correct path. I passed a house on the right around the halfway point, then entered a gap about 2.0 miles from the start. Here, a short section of hand-built trail delivers you back onto an old logging road. Follow the signs. The trail crossed a small flowing spring branch just before arriving at a stone pile on the right, which marks an old home site. The spring was likely the water source for the old homestead. From here, the hand-built trail reappears, which I followed up to the summit & pastures. The forest in this area is struggling. It’s choked with invasives, and many of the native trees are dead – including what used to be a significant population of Carolina Hemlocks. Native vines have also taken advantage of openings in the forest created by the invasives, and they climb all over each other. I noticed several creepy poison ivy “zombie trees” – dead trunks still standing (usually locust) covered in the noxious vine, which has climbed to the top and spread out its own canopy of branches. Some of the poison ivy vines are so thick and old they’ve died of old age! A few larger “landscape trees” – mostly oaks – poke out of the thickets in places. All in all, this area looks for the most part like reclaimed pasture land. As you approach the still-maintained pastures, you’ll reach a stile which takes you over the barbed wire fence. On the other side, the trail winds through some brambles and young trees before popping out in the grassy area where a magnificent view awaits! The air was fairly clear New Year’s Eve, so I was able to see all the way from Bearwallow Mountain, down the Hickory Nut Gorge to a small sliver of the Piedmont region, across to Little Pisgah and beyond, up to the Craggy and Black Mountains. At the top of the pasture was a modular pen, but with no animals in it. The grass was trodden down so it looks like they’d been there earlier in the year. It looked kind of neat with the pasture and mountains as a backdrop. After a satisfying pack lunch in the pasture, I met a couple who rode their horses up from Hickory Nut Gap on US 74-A. Plans for the trail call for its continuation from the pastures down to that point, but that’s currently not an official trail. So, I headed back the way I came to wind up a great hike in Bearwallow Gap where I parked. 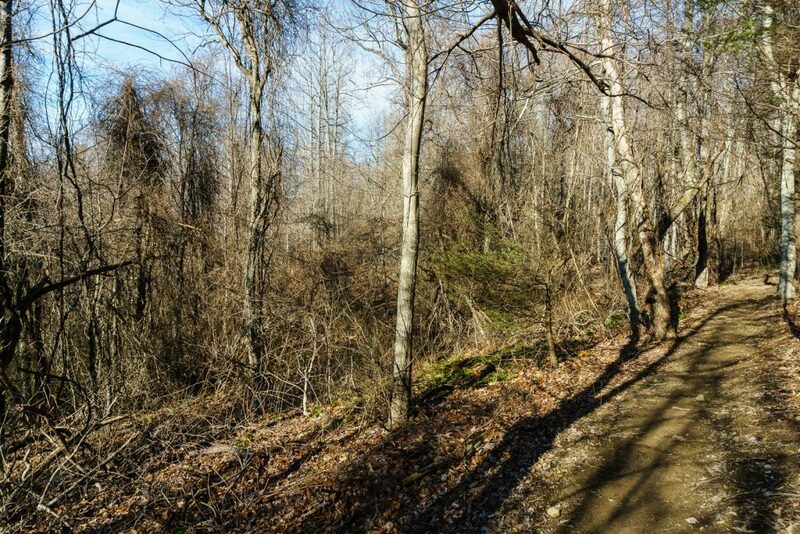 While the new trails in Hickory Nut Gorge are not complete, the trail network is coming along beautifully and it now makes a compelling destination – especially for us Ashevillians, considering how close the trailheads are from the city. Is camping allowed in the Bearwallow pastures? Not without permission from the landowners; it is all private property.